Reading Goal: To read at least 8 books (I will list them below as I finish them). 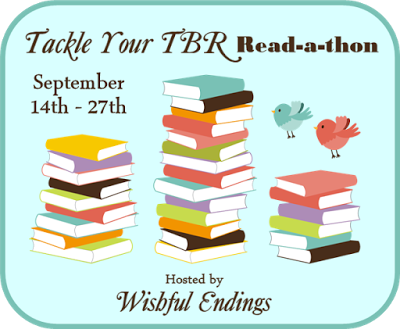 Note: I am hosting a read-a-thon challenge on 9/25, so watch for the details. This event runs September 14-27, 2015. Reading Goal: I finished reading At Home in Persimmon Hollow by Gerri Bauer. Will be posting my review for the blog tour with Franciscan Media on the 18th. 1 book down and 7 more to go. Challenges Goal: I entered the Katherine Reay giveaway. Reading Goal: I finished reading Dauntless by Dina L. Sleiman and got about to about 1/3 of the way through The Perfect Cast by T.K. Chapman. Challenges Goal: I entered the Random Page Challenge. Reading Goal: I was gone part of the day and am currently working with an author to set up a blog tour, which took up part of my day, but I did start reading The Memorey Weaver and got to chapter 6. Challenges Goal: I participated in the Melissa McShane challenge. What are your favorite comfort reads? It looks like there are several people that have already said Anne of Green Gables by L.M. Montgomery, but I am going to say it too. I have re-read my copy of this novel so many times that it is quite literally falling apart. Reading Goal: I reached less than 100 pages from the end of The Memory Weaver by Jane Kirkpatrick. Challenges Goal: Did not participate in any challenges. Reading Goal: I read to about the half way point in Jasper's Lament by Katherine Pym. Reading Goal: Reached about the half-way point in Heart's Journey by Kristen McKendry. Challenges Goal: Entered the Lisa Wingate giveaway. Reading Goal: Finished reading Jasper's Lament by Katherine Pym and The Perfect Cast by T.K. Chapin. Challenge Goal: Entered the Jessica Leake giveaway. Reading Goal: Finished reading Heart's Journey by Kristen McKendry and The Promise of Palm Grove by Shelley Shepard Gray. Challenge Goal: Did not participate in any challenges. Reading Goal: Finished reading To Get to You by Joanne Bischof. Challenge Goal: Participated in the Seasons Challenge and giveaway. Challenge Goal: Posted link to TBR List Challenge here on my site. Overview for Reading Goal for Read-a-thon: I completed my reading goal of 8 books, even completing one more than my original goal. Overview for Challenge Goal for Read-a-thon​: I entered/participated in 5 giveaways and challenges.